Senate Republicans plan to include $12.7 billion in disaster aid and government funding through the end of the fiscal year in their bill to advance President Donald Trump’s immigration proposal. The president’s plan will test Democrats’ solidarity, pitting border security funding against protections for young immigrants and refugees. Now, it will also force Democrats to vote against bipartisan funding levels, aid for disaster-hit communities and an extension of the Violence Against Women Act, according to a summary of the Senate plan, obtained by POLITICO. 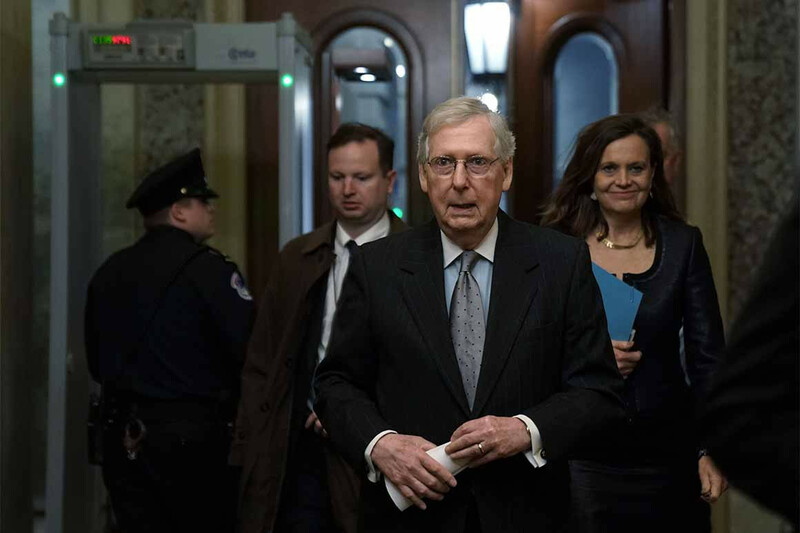 Senate Majority Leader Mitch McConnell (R-Ky.) on Saturday said the Senate will take up the package in the coming week. The bill, which has yet to be released, would reopen the nine shuttered federal departments and dozens of agencies through Oct. 1 and will include the full $5.7 billion Trump requested for a wall along the U.S.-Mexico border. It would also provide a three-year extension of protections for young immigrants enrolled in the Deferred Action for Childhood Arrivals program and an extension of Temporary Protected Status for refugees currently covered. The Senate GOP proposal includes $70.4 billion in total discretionary spending for the Department of Homeland Security. That includes a $5.9 billion funding boost for Customs and Border Protection, to pay for an additional 750 Border Patrol agents and 375 new CBP officers. It would provide $8.5 billion for Immigration and Customs Enforcement — a $1.4 billion boost above current levels — funding an average detention capacity of 52,000 immigrants a day and an additional 2,000 law enforcement personnel. The bill will also include nearly $2.2 billion for the Secret Service, which will help fund hiring for Trump’s 2020 presidential bid. But there is little hope on Capitol Hill that the package will end the shutdown, which entered its fifth week on Saturday. Democrats remain firm in refusing to negotiate an immigration deal until after the government is reopened. “The president’s trade offer — temporary protections for some immigrants in exchange for a border wall boondoggle — is not acceptable,” House Appropriations Chairwoman Nita Lowey (D-N.Y.) said in a statement following Trump’s televised immigration offer on Saturday. House Democrats plan to take up their tenth bill to reopen the government in the coming week. Each previous bill has netted only a few Republican supporters, with McConnell saying the Senate won’t take up any spending bills the president won’t sign. The House bill also reflects bipartisan conference agreements Republican and Democratic appropriators in both chambers negotiated last year. Can Brett Kavanaugh really sit on the US Supreme Court dishing out morality now?